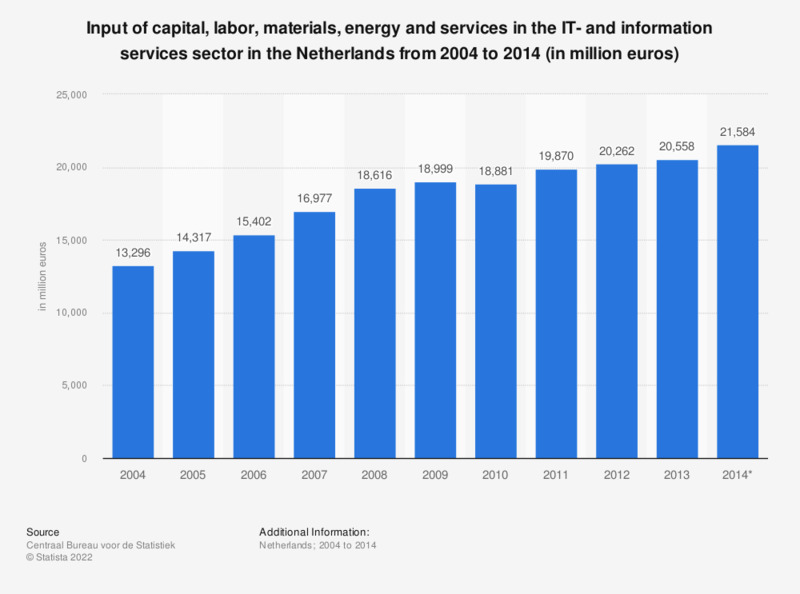 This source displays the total input of the production factors capital, labor, materials, energy and services in the IT- and information services sector in the Netherlands from 2004 to 2014 (in million euros). Between 2004 and 2014, the total value of the annual input of the production factors in this sector increased from 13,296 to 21,584 million euros. The sources defines the input of production factors as: "The total deployment of the production factors capital, labour, energy, materials and services in the production process (KLEMS is an acronym [in Dutch] for capital, labour, materials, energy and services)." Moreover, the source notes: "Production factors in the growth accounts consist of labour, capital and intermediate consumption when the output is production. If output is value added the production factors are labour and capital." In regards to the used model, the source adds: "The official SN calculations use an ex ante interest rate based on the internal reference rate of banks and a risk premium for calculating capital services. The model allows for profits to be made as opposed to the neoclassical model." The source states, this category includes the "Support activities in the field of IT; Information service activities". Statistics on "Economic Outlook Netherlands"